PRISTINA - "The requirement to be successful had to open the camps to the people of Kosovo” with these words KFOR Commander gave his last addresses to his military and civilian personnel and to all local and international guests who attended the Transfer of Authority ceremony. The Change of Command between Major General Giovanni FUNGO and his successor and peers Salvatore CUOCI took place during a suggestive ceremony held in Camp Film City, in Pristina. 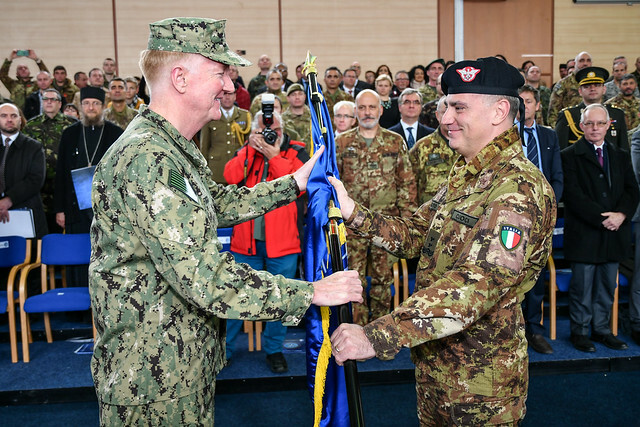 The event was attended by Admiral James FOGGO, Joint Force Command Naples Commander, President of Kosovo Hashim THAÇI, Admiral Giuseppe CAVO DRAGONE, Italian Joint Operational Headquarter Commander and several others civilian, military, religious and diplomatic authorities. In his farewells speech MG FUNGO highlighted "the high professionalism, the great commitment and the absolute dedication” of all the military and civilian personnel under his command. They make all this possible. He also expressed his gratitude to the representatives of Institutions in Kosovo for the support received. Finally he wishes all the best to MG CUOCI in achieving his mission. KFOR is a NATO led operation and, in accordance with its mandate by United Nations Security Council Resolution 1244, contributes to maintain a Safe and Secure Environment (SASE) and guarantees Freedom of Movement (FoM), cooperates and assists the United Nations, the European Union and other International actors to support the development of a stable and peaceful Kosovo.